← Audax UK Prizegiving – The Willesden Haul! 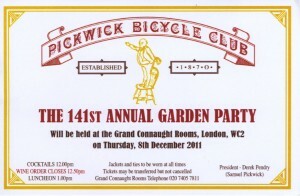 “The oldest club in existence is the Pickwick Bicycle Club, formed in June, 1870. It took its name from the work of Charles Dickens, and for some reason now forgotten the members each chose nom de guerre from the pages of the Pickwick Papers”. The Willesden CC has two Pickwickian cyclists, “Mr Mallard” (Ray Kelly) and “Thomas” (Séan Bannister). At Christmas time they hold what is logically called the Annual Garden Party. Last week it was held for 141st time. The WCC Club Captain and your truly were fortunate to be invited. It was a very jolly day where we almost rubbed shoulders (apparently rubbing shoulders is not allowed) with some of cycling’s great, good and historic. 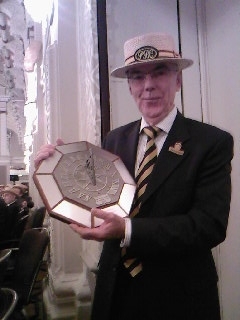 The highlight of the day was “Mr Mallard” being award with a trophy for the only PBC member to complete this year’s PBP. And we were all on the top table. Unlike the Edgware who were sitting in the cheap seats!!! !